After dealing with my house mate and her abuse and violence, I am much more aware of safety issues than I ever thought of before. I want to share some of these with you. Not everything will apply to your situation, but take what is useful. When you have a family member who is using any kind of drug, it is a mind altering substance. Therefore, that person does not operate in the same way that non-drug users do. Also, many drug users began using drugs to 'self-medicate', because the drug makes them feel better or more normal or more able to cope or work. If there is an underlying mental condition, self medication is often used rather than a visit to a doctor. Whatever started the user down the path, the result is that you are probably dealing with someone who is not functioning very well mentally. This can range from an occasional pot smoker being a bit 'out-of-it' to a full blown meth addicted tweaker. Thus there is a serious potential for all kinds of dangers in the home. For example, my house mate set fire to the sofa on our front porch. It was only by the grace of God that the house did not burn down. Cigarettes/pipes can be left burning where they can start a fire. Electric appliances can be misused and pans left on stove tops. For your safety, be sure you have adequate smoke detectors in your home and test them regularly. On another occasion my house mate fell asleep at the wheel of her car. Luckily, she went into a field and no one else was involved. Another time she mounted the pavement while trying to light a pipe while driving. Luckily no one was standing there at the time or the results would have been disastrous. Drug users behind the wheel of a vehicle are an accident waiting to happen. Most states have drunk driving laws but some do not have laws for drugged driving. Drug paraphernalia may be left around the house. 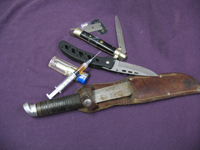 Lighters, razor blades, drug residue, used syringes or questionable liquids in small bottles. All these pose a threat to anyone who does not recognize them or suddenly gets stuck with an infected needle. Another danger of a drug user in the home is infections. HIV/AIDS is common among users as is Hepatitis C. Users can get infected sores and MRSA's. MRSA stands for methicillin-resistant Staphylococcus aureus, which is a type of infection which is resistant to antibiotics and can be fatal. It can be responsible for serious skin and soft tissue infections and for a serious form of pneumonia. Drug users can be irresponsible over safety in their sexual activity and often end up with sexually transmitted diseases. This brings up another issue - that of letting unknown and unwelcome visitors to the house. Not only can these visitors remove anything that is lying around - they have been known to ask to use the bathroom and clean out the medicine cabinet - but other things may vanish also. If you have children in the home, these visitors may compromise the safety of your children. You may not find out for years that your child was sexually assaulted but it can and does happen. Drug dealing. This is a very bad news. My house mate was allowing drug deals on my front porch. I only found out by installing hidden cameras. When I saw what was happening at my house in my absence I was appalled. I saw that my old and almost-blind dog was kicked. I saw that she rarely went to bed at night. I saw her bringing stolen goods into the house. I finally saw how much in the way of drugs she was using. If you have any idea that the user in the household is dealing drugs, then you need to treat this as an emergency situation and get yourself and any children/animals to a place of safety. The penalties for drug dealing can be severe. Children in the home can be initially put into care for their own safety. The police or sheriff may come with a warrant and search your home. When ever there is a drug abuser there are almost always weapons of some kind, whether it is guns, knives, knuckle dusters, flick knives, hatchets or clubs. Aside from the fact that these can fall into the wrong hands (children for example), having any weapon round a drug addict with an attitude is not comforting. You may have to go to court and obtain a restraining order. My house mate threatened to shoot me! She owned a Colt .45 and was an excellent shot. What worried me even more was the rifle with a scope on it. So if you know that there are weapons in the house be doubly careful. A mix of drugs and weapons is always unsafe. Drug addicts do not have the balanced mental ability to safely handle a gun. Only you can assess the danger you may be in. I urge you not to make the mistake I did and think it cannot happen to you - it can!